Course Website: Official Website - Visit Desert Canyon Golf Resort's official website by clicking on the link provided. 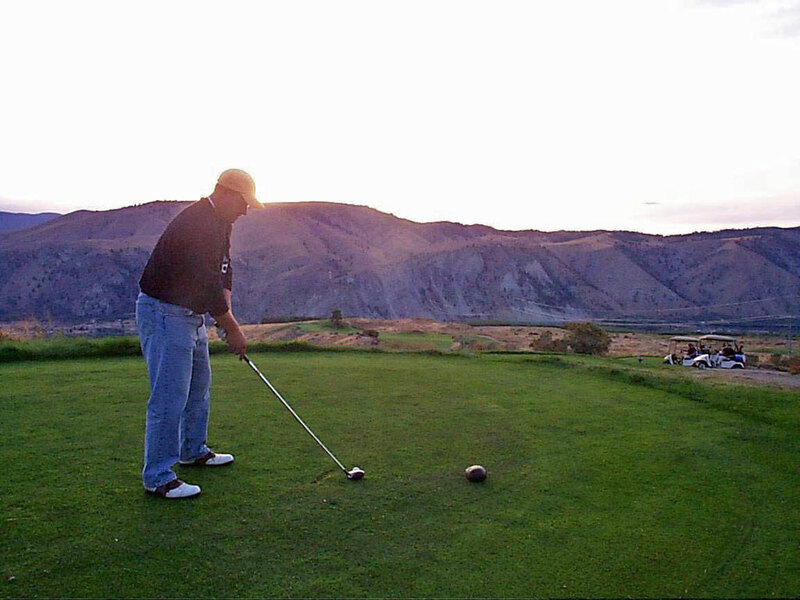 Accolades: Ranked 12th in Washington on Golf Course Gurus' Best in State list. 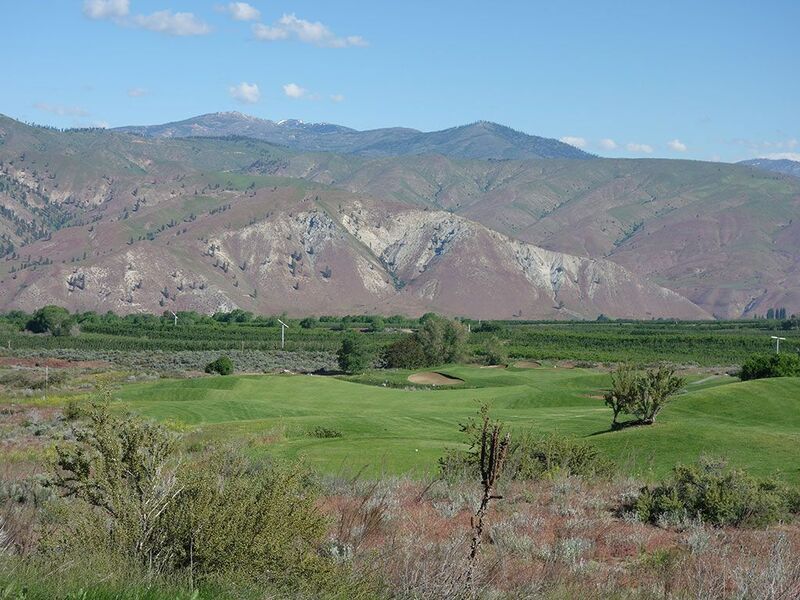 What to Expect: Desert Canyon is a high desert course located in Central Washington 25 miles north of Wenatchee. 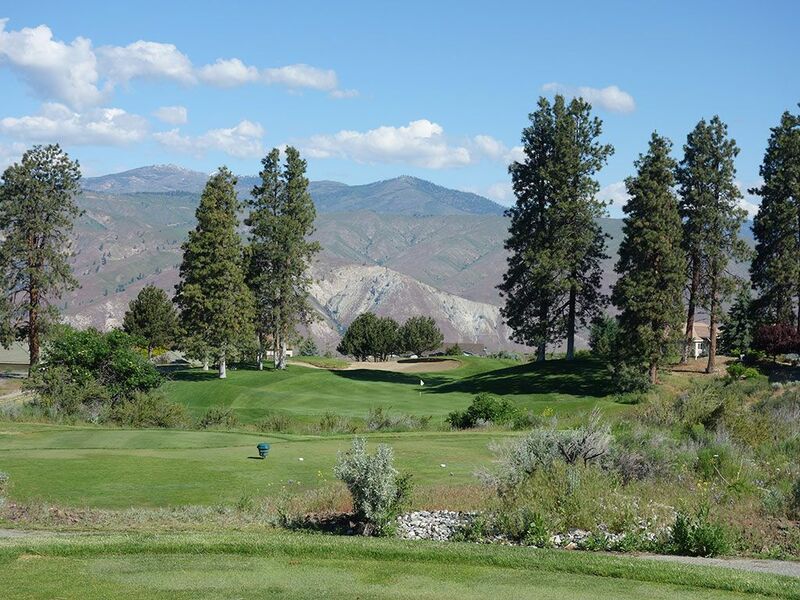 Though the course has gone through financial troubles and ownership changes in the past, Desert Canyon remained as a lead attraction for golfers in Central Washington. 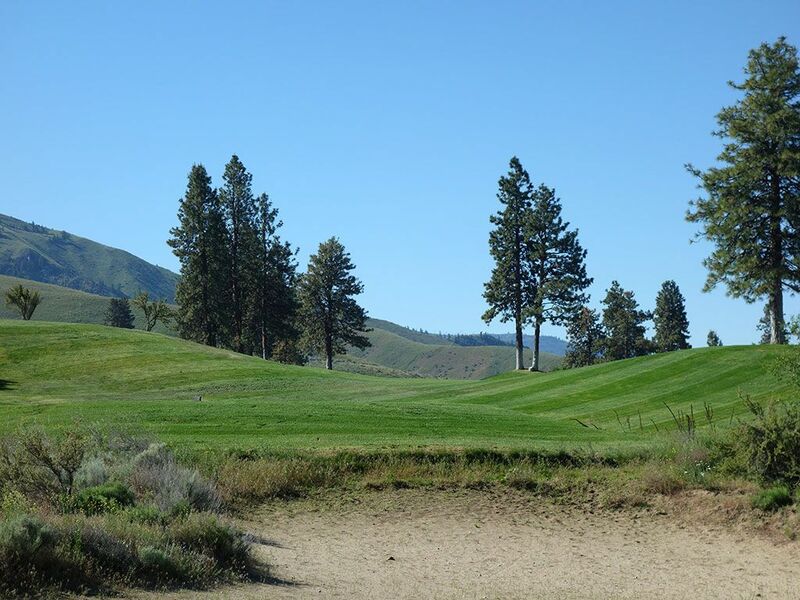 The course distinguishes between its two nines by naming the front "Lakes" and the back "Desert" which is appropriate considering the front nine has more water that comes into play while the back is carved through the desert terrain. Plenty of elevation changes exist throughout the layout but none more dramatic than the 180 foot descent from the back tee to the green on the all-world par five 15th hole. 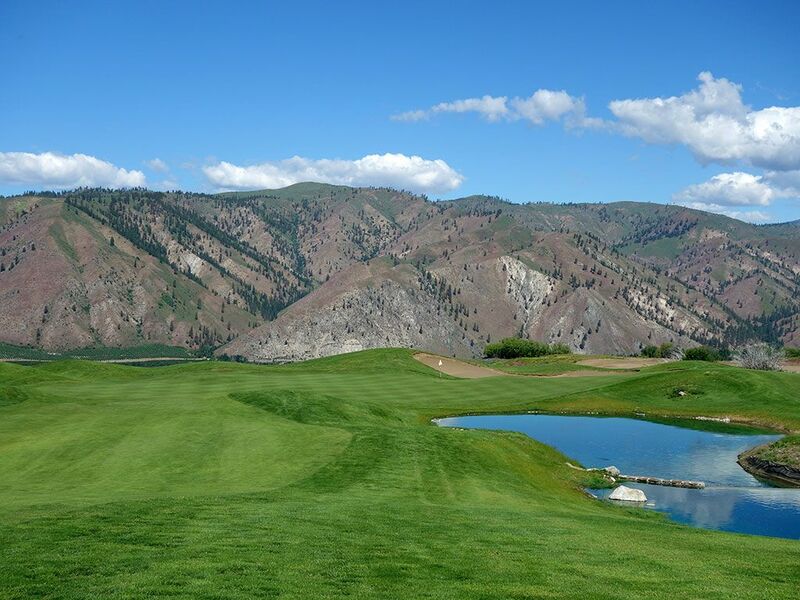 It is without a doubt the most memorable hole on the course and offers impressive views of the Columbia River and an exhilarating design. 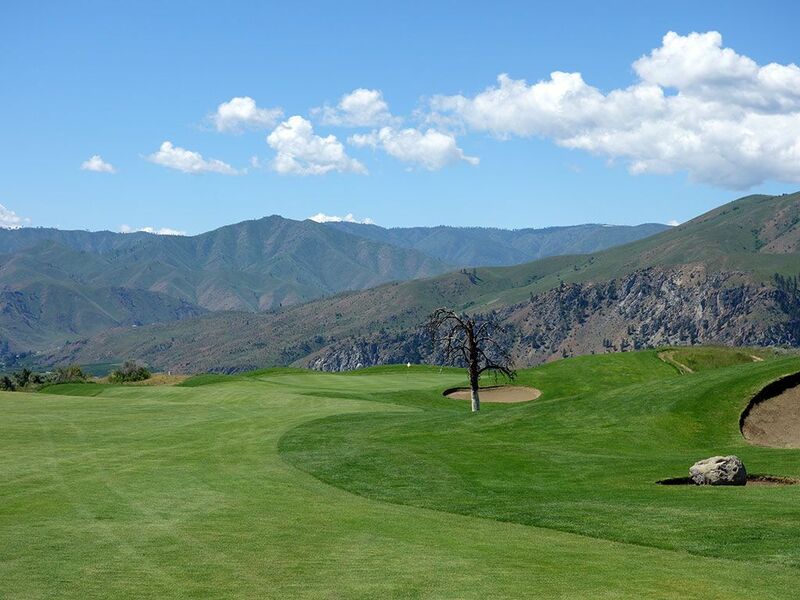 With five sets of tees Desert Canyon makes a strong effort to cater to the resort crowd and every level of golfer that crowd brings. 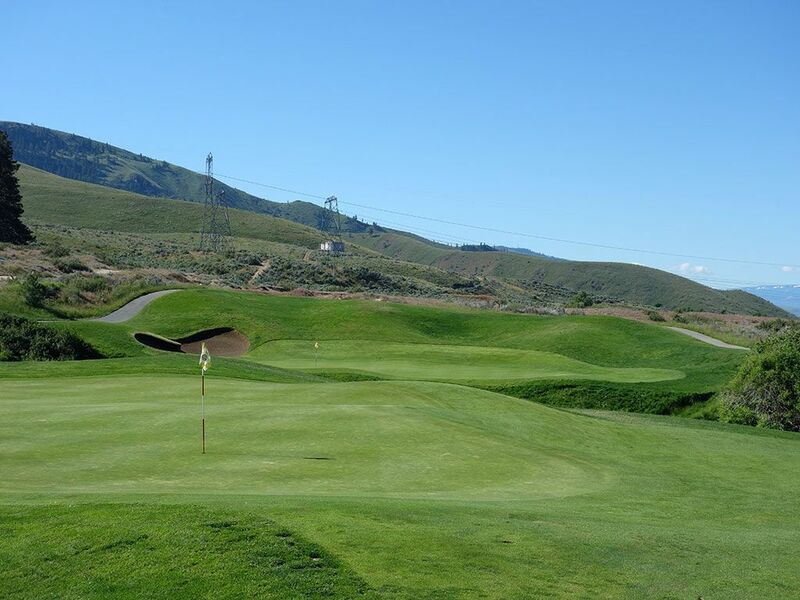 The conditioning isn't as prime as Bear Mountain and Gamble Sands but is commendable and adds to the overall experience though the 3.5 acre 18 hole putting course isn't maintained at the same level as the full course. From the back tees you'll contend with some semi-blind shots but the GPS on the cart can help guide you through the round and make sure you are choosing wisely before pulling the trigger on a shot. The on-site accommodations are great and highly recommended to book as part of your visit. With granite countertops, quality finishes, and golf course views, the condos are a comfortable place to relax when the golf is over. 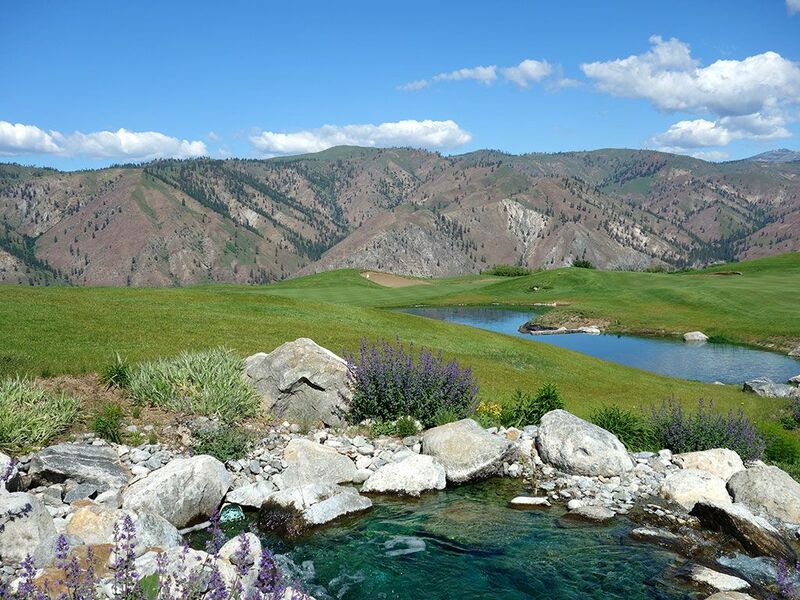 Ultimately, Desert Canyon should be included as part of any golf trip to Central Washington and the accommodations make it a great place to hub from while in the area. 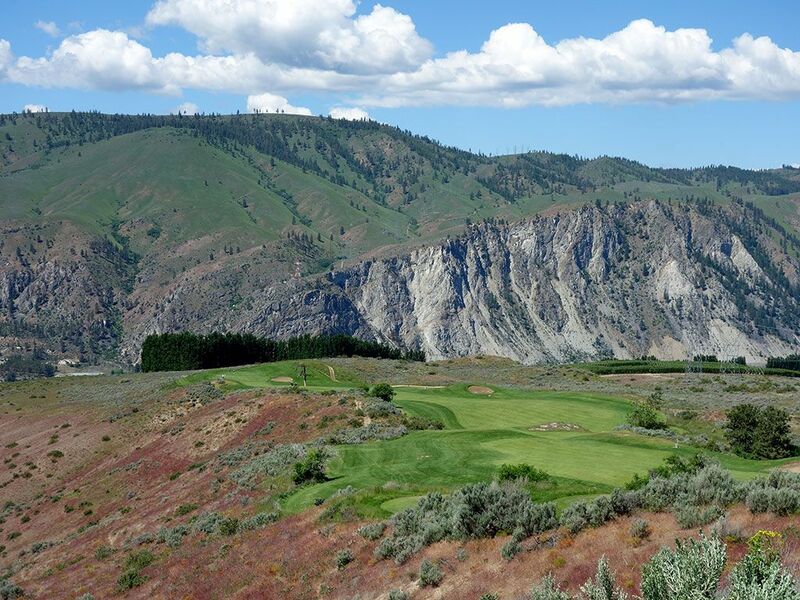 Signature Hole: 15th Hole – 679 Yard Par 5 – One of the most iconic golf holes in the Pacific Northwest is this incredible downhill par five that travels nearly 700 yards before terminating on a bluff above the Columbia River. The fairway narrows down to a sliver near the landing zone and will cause players to decide whether to lay up to the flat spot short of the sliver or try to bomb your drive over it. The fairway then follows a ridge as it bends left all the way to the green. A lone tree sits a bit short and right of the green and can cause havoc on approach shots for players who conservatively played to the right side of the fairway in an effort to avoid the cliff edge that frames the left side. It is without a doubt one of the most memorable and impressive par fives I've ever played. Best Par 3: 8th Hole – 224 Yards – Playing back across a chasm and into an amphitheater of trees, the 8th is an attractive yet formidable hole. The sloping green can quickly push players towards a three-putt if they get above the hole so if you are in between clubs then the shorter option, as long as it is enough to clear the front edge, is the prudent play off the tee. Playing a bit downhill will allow your ball to stick, or even back up a bit, so go if the distance feel good then go pin seeking and try to pick up a bird. Best Par 4: 5th Hole – 482 Yards – I love the way this hole is shaped and how it fits my eye. This sweeping downhill two-shotter gives players a generous driving zone before doglegging left and setting up for a heroic approach shot. The cautious player can bail out to the right and attempt to get up and down with a chip across the wide, but relatively shallow, putting surface in an unstimulating but safe approach to this hole. The rewarding approach shot flies the hazard fronting the green and boldly attacks the flagstick wherever it might be on the undulated putting surface. Bogies will be plentiful here while pars almost can't help but leave a smile on your face. Best Par 5: 7th Hole – 575 Yards – The 7th is a shot makers hole that is going to require all three elements of your game; accuracy, distance, and finesse. With towering pines feathered throughout the hole, players will have to rely on their accuracy to find the short grass, most of which is blind. Without enough distance you can forget about going for this green in two which is fronted by a chasm all the way up to the edge of the fringe. Whether you lay up or go for it, you'll need to employ finesse with any edge shots around the green or with the flat stick in your hand. Players utilizing the forward tees are given an alternate green to play which is short of the chasm and accessible for all skill levels. Going for this green in two is perhaps the boldest play of the day with a high level of risk and reward associated with it. Birdie Time: 10th Hole – 536 Yard Par 5 – With a wide, downhill fairway smiling back at you while standing on the tee box, the par five 10th is the perfect birdie opportunity at Desert Canyon. There should be little fear in doing anything other than trying to uncork a big drive down the short grass and then hitting a mid-to-long iron into the putting surface. A pond comes into play on the right side of the green which can easily be avoided with the generous opening found on the left half of the putting surface. 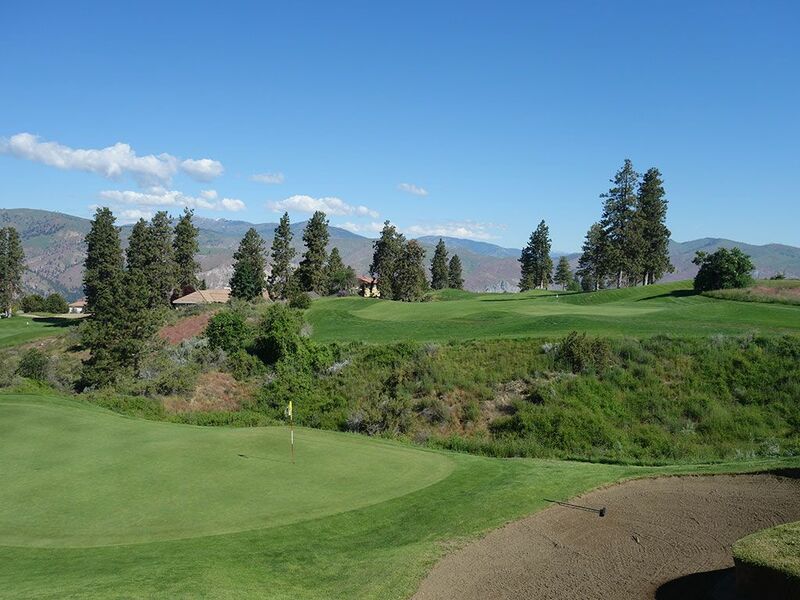 With inspiring views of the Columbia River in the distance and an inviting layout, the 10th is a hole to be taken advantage of. Bogey Beware: 13th Hole – 436 Yard Par 4 – The 13th is the #8 handicap on the card but don't let that fool you, it offers plenty of trouble. Off the tee a desert waste area must be carried and then avoided as it continues running up the right side of the hole. Driver may be too much since the waste area cuts the fairway off all together about 280 yards from the back tee. After nestling a drive into a safe spot, the challenge isn't over as you have to carry the waste area to a green protected by a large bunker on the left and a pot bunker on the right. 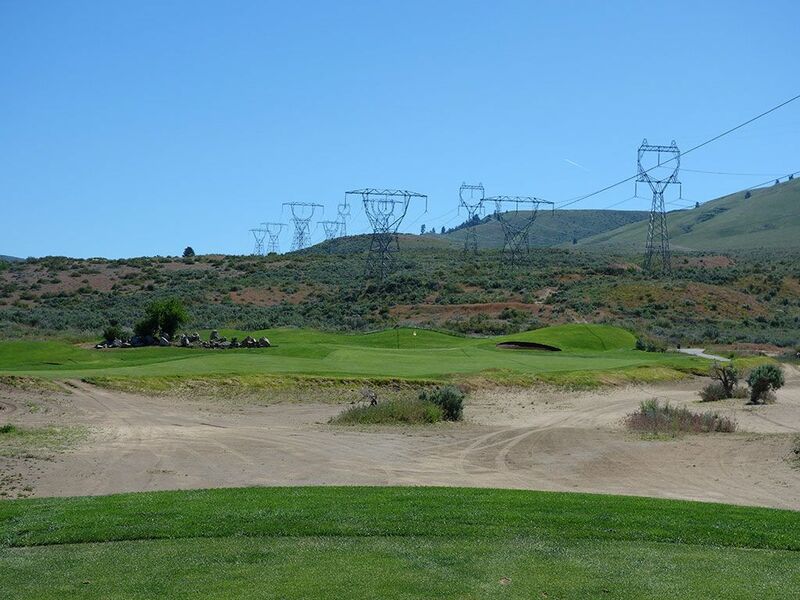 Throw on top of that the eerie feeling you get playing right next to power lines and listening to them buzz the whole way up the fairway and you get a hole that can throw a bogey on your card pretty quick.